New York is all about change. It’s our thing and I get it. Scan any given street in Manhattan and chart the architectural beats between Gilded Age to postmodern, knowing it’s all been shaped by money. That’s what first sent the grid crawling uptown and then the ascension of the city up into the sky. Yet, since 2000, the cultural life of the city seems to have been denigrated by what happens between recessions. Though the fear of the “bad ol’ days” of the Seventies is lorded over every citizen of Gotham, it has only been during the recessions that mom and pop stand a chance. When Wall Street is churning, it seems that all the non-corporatized vestiges of New York are chased out by the ceaseless development of generic buildings with chain stores on street level. This realization hit me in the gut two months ago as I sat in on a torn vinyl bench at Two Boots Pizzeria on Greenwich Avenue, watching St. Vincent’s Hospital being torn apart to be replaced by another round of luxury condos. New York is the New World capital of pizza, making it ever more ironic that Two Boots’ Louisiana-inspired pies are testament to a more community-minded city. Two Boots, whose name refers to the geographical boots of Italy and Louisiana, first opened in 1987 on Avenue A at a time when the East Village was full of artists, junkies, and aging Ukrainian immigrants. It spread out to other downtrodden neighborhoods around the Northeast and was always decorated by local artists and home to poetry readings and impromptu art shows. It is now also a national chain that can be found everywhere from Echo Park near Dodgers Stadium to Citi Field in Queens. Yet the Two Boots outpost on the corner of Greenwich Avenue and 7th Avenue remains a little temple to New York in the 1990s, when the city was a nearly perfect stew of optimism and grit. 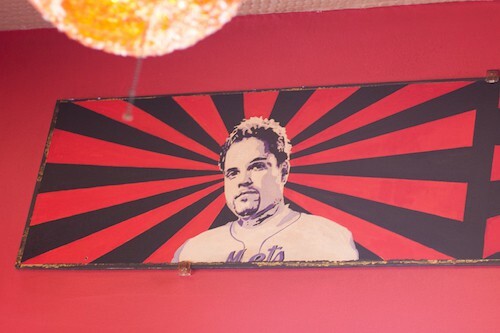 In fact, I think the painting of Mike Piazza on the wall should be given shrine status. The walls look worn, but are painted with murals that smack of influential mid-’90s graphic design created by Paula Scher’s Public Theater posters, when John Leguizamo was just making a name for himself and Savion Glover starred in Bring in Da Noise, Bring in Da Funk. The party beads that still hang on the wall remind me of all the fun tchotchke shops of the Village before they closed and were replaced by luxury shops that allow you purchase a pair of $500 sunglasses on your way to the Jitney and then easily return them in Southhampton. I did used to wonder how those little stores made the rent, and I always hoped that the shopkeepers owned the building. 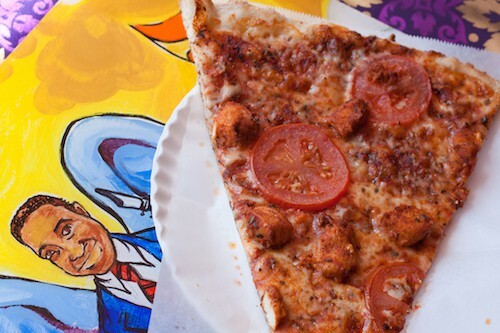 Two Boots is mostly a to-go joint, but you can sit in the wedge-shaped space to eat your slices, which also pay homage to the ’90s with names like the Mr. 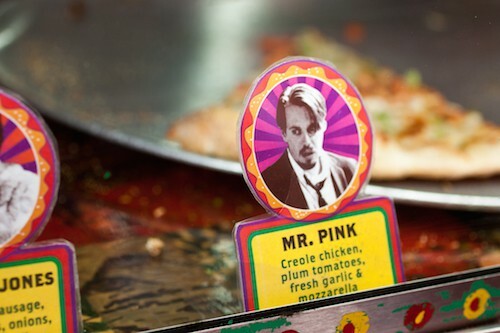 Pink studded with pieces of Cajun-spiced chicken. The signature of Two Boots is the cornmeal crust, which is an ingenious way to keep pizza from sticking to the pan, each morsel acting like a little ball bearing. I’ll say it one more time for the record. I understand that the city is a fast-moving organism and change is part of the deal. But the demolition of Saint Vincent’s remains a hard pill to swallow. It was fiercely devoted to its community before all else, even if its largely LGBT community wasn’t aligned with its Catholic tradition. It was ground zero for the AIDS crisis and then the outpost for Ground Zero during the 9/11 attacks. It was our hospital, New York, and we let it go for more condos. 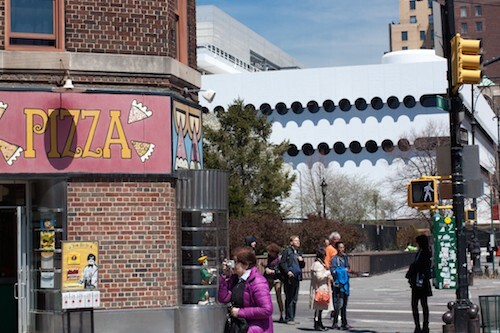 Next time you’re in Greenwich Village, stop and have a slice of pizza at Two Boots. Then have a beer at Fiddlesticks or Wogie’s and maybe have the bangers and mash at Tea & Sympathy. Throw some money at the vestiges of a more authentic time in New York that may not survive until the next recession. Danielle Oteri is the founder of Feast on History, which offers tours, classes, tastings, and dinner parties that bring culinary history to life. A tireless sleuth of everything tasty, Danielle writes about subjects as diverse as saints, butchers, and hole-in-the-wall restaurants. She contributes stories about culinary history and Italo-centric recipes. Danielle Oteri is the founder of Feast on History, which offers walks, classes, tastings and dinner parties that bring culinary history to life. A tireless sleuth of everything tasty, Danielle writes about subjects as diverse as saints, butchers, and hole-in-the-wall restaurants. She contributes stories about culinary history and Italo-centric recipes.